CCleaner has been one of the most trusted PC utility programs available over the past decade, and not without reason. The software is very light on resources, yet powerful enough to keep your computer in good health over a long period of time. It comes with the usual set of tools you’d expect from a computer utility software, but is generally believed to be one of the safest and most efficient utility software available in the market today. What’s more, the program was actually entirely free for home use until recently, and although it now has a paid version with some extra bells and whistles, most of the important features are still available in the free version, which is one of the reasons it continues to remain a favorite even today. BleachBit is a free, open source computer maintenance software that’s available on all three major platforms – Windows, Linux and Mac. Like CCleaner, it is a lightweight, but powerful program that bundles a disk space cleaner and privacy manager that can identify and delete temporary and cached files in web-browsers, mail clients, and other software, like Java, Flash, Adobe Reader, Skype, Google Earth, MS Office, Libre Office and various other apps. The program comes with a clean and minimalist interface, and allows users to check and approve files in each category before deleting them, so as to prevent any accidental deletions. BleachBit can also perform a deep scan of the system, but it’s slightly slower, and took about a minute on my admittedly clogged-up office PC with a 500GB hard drive. However, it can clean up unnecessary cached files for Windows Explorer, like recently used items, thumbnails and explorer/start menu search history. You can also shred files, folders and wipe free space for even more privacy. As is the case with most FOSS software hosted on Github, BleachBit is a donationware, so do consider rewarding the developers for their hard work if you like the program. Privazer is one of the best, most powerful and customizable utilities for those who are looking to preserve their privacy. It shares quite a few attributes with CCleaner, insofar as it is easy to use and helps you erase temporary files that build up in your PC over time and can prove to be a huge drag on performance, as well as a threat for your privacy if not cleaned up in time. The program allows you to perform on-demand scans and securely cleans the system, wiping out all history from your browsers, photo editors and other programs that may compromise your privacy. 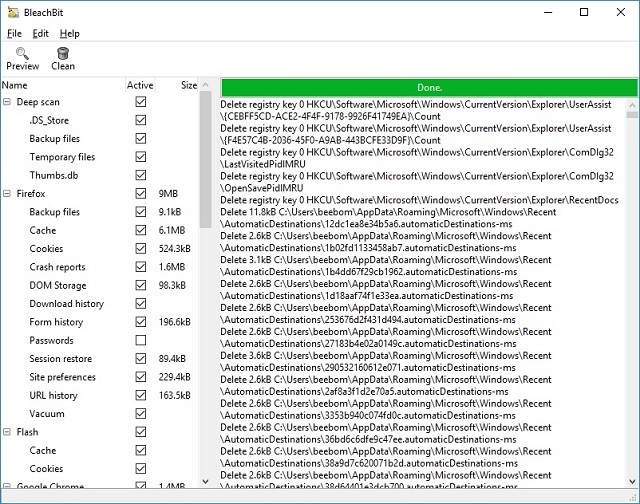 PrivaZer may predominantly be a privacy-oriented app, but it also allows users to clean out useless files left by previous versions of Windows, system updates and installers. The user interface is simple and intuitive enough, but the unlike CCleaner, program does require a little bit of knowhow to set-up, mostly because it offers so many different options about what to scan and what not to. However, it also includes a ‘Default’ mode that should be good enough for most people. One interesting thing is that, the program actually doesn’t have a disk cleanup utility of its own, so it uses the native disk cleanup option built within Windows to get the job done, making it a notoriously time-consuming exercise, so it is probably for the best if you used some other system utility for at least the Disk Clean feature. Like BleachBit, PrivaZer is also donationware, but you can also download a ‘Donors Version’ which comes with much the same functions, but will get you the warm, fuzzy feeling of doing the right hing and helping in the further development of a great software. 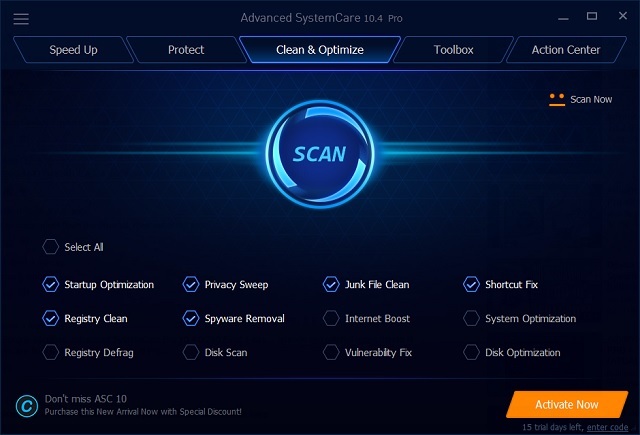 Iobit’s Advanced SystemCare is one of the most popular and efficient PC utility programs available today. It comes with many more utilities than CCleaner, most of which are actually available in the free version. Iobit also offers a paid version of the program that comes with a whole lot more bells and whistles. Alongside CCleaner, this is one of the programs I personally use on my Windows PCs, so I can actually vouch for the fact that most of the functions in the program’s toolbox actually works, although, I have no idea about the efficacy of its malware scanning feature, because I can’t remember getting infected with malware in a very long time. One thing I can tell you, is that unlike many AV programs, it doesn’t give you any false positives, so that’s a definite plus. The utility gives you the option to defrag your hard disk, manage your drivers, shred files, scan disk for bad sectors, clean and defrag the Windows registry, change OS settings and plug security and privacy loopholes. Then there’s also the Performance Monitor widget that goes above and beyond what you get from perfmon.exe, and in a more user-friendly interface. It shows you the CPU, RAM and hard disk usage and network traffic in a tiny little window on the top right, but you can get rid of that from the settings. You can also free up your RAM by killing off unnecessary, resource hogging background processes. Rescue Center allows you to create and delete system restore points while Turbo Boost helps speed up Windows by disabling unnecessary processes and services. As its name suggests, CleanMyMac is a Mac-only utility, although, its developer, MacPaw, also makes a similar program for Windows PCs called CleanMyPC. 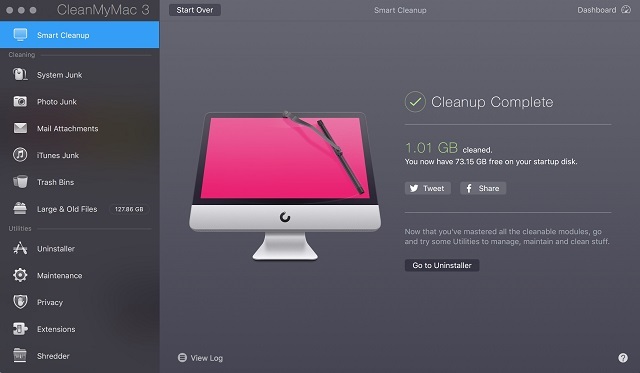 While that one is still an unproven entity for the most part, CleanMyMac has been around a little while longer and, alongside CCleaner, is one of the most-recommended utility software for Macs. Like CCleaner, this one, too, comes with a number of bundled utilities, like a software uninstaller, file shredder, iTunes and iPhoto junk cleaner and other tools, like a Smart Cleanup option that automates the process of maintaining your PC by using default settings to clean up your beloved Mac. The program can also give you detailed info about the hardware on your Mac, and a hard drive health check, available RAM and remaining battery (on Macbooks). There’s also a scheduler that allows users to specify when they’d want to run the next scan. Currently in its third-generation, the software has added a boatload of features and utilities without making it too much of a drag on the resources. The UI is now less cluttered than it was in version 2 and each function now also comes with a brief explanation about what it proposes to do. However, the one thing to note here is that, you won’t be able to try out all the features before you buy it. That’s because the trial version of CleanMyMac 3 scans your Mac entirely, but only removes a maximum of 500 MB of junk. Also, the trial only allows you to use 3 of the maintenance utilities. 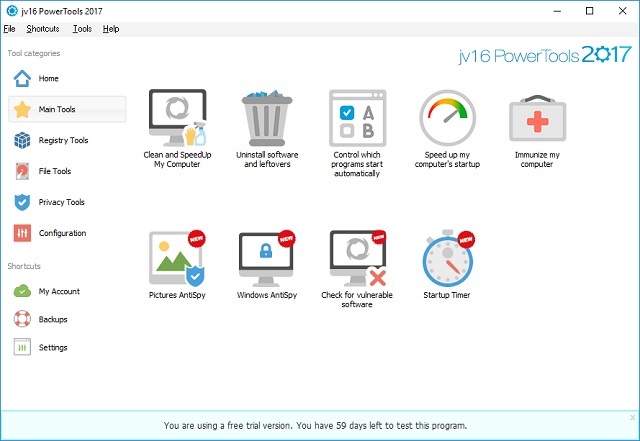 jv16 PowerTools is a PC utility that comes with a lot of advanced options to clean your PC and get rid of all the junk files, folders, registry entries and leftovers from previous uninstallations. The user interface is not as attractive and colorful as some of the other utilities on this list, but the program is generally aimed at slightly more experienced users who’re unlikely to be put off by the relatively bland interface. While there’s a ‘Simplified UI’ for novice users, there’s also an ‘Advanced UI’ option that actually allows you to tweak and fine-tune settings that you won’t find in too many other software. It is a full-fledged optimization suite, and like CCleaner, it offers you multiple options, like Registry Cleaner, File Tools, System Tools, Privacy Tools and a startup manager, while other utilities include a software uninstaller, an anti-spyware scanner, a startup timer and even a website black-lister, none of which are available with the Piriform app. Overall, jv16 PowerTools is certainly more customizable than not only CCleaner, but many others on this particular list as well, although, it can be a little sluggish at times. 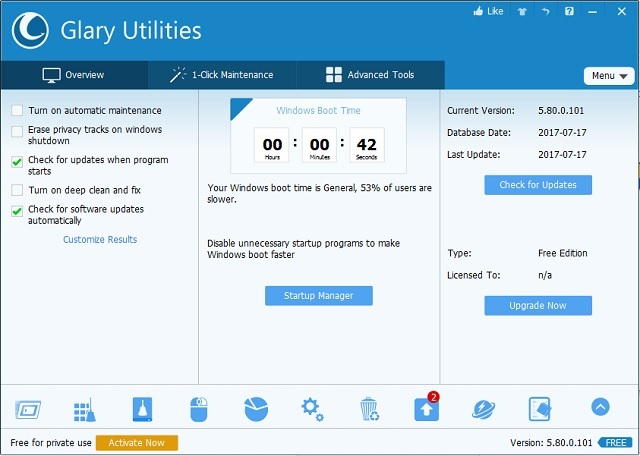 Glary Utilities is one of the more well-known names in the world of PC tuneup, and comes with a bunch of system utilities that enables users to tweak, repair, optimize and improve the performance of your computer. Like most of the other programs on the list, it too, comes with multiple built-in utilities, like a disk cleaner, a registry optimizer, an uninstall manager, a memory optimizer, a file shredder, a duplicate file finder, a history eraser etc. Like CCleaner, Glary Utilities is also lightweight, intuitive and works as advertised for the most part, helping users remove unnecessary files from the system and recover space on your hard drive. Glary Utilities also has a feature that allows users to scan the computer for available software updates, so if you’re too busy to check every single program for updates on a regular basis, this little utility is likely to help you out with that. Interestingly, the program also has a ‘Browser Assistant’ feature that allows users to control their Firefox, Chrome and Internet Explorer web-browsers all at once from within the program, making the whole process hassle-free. 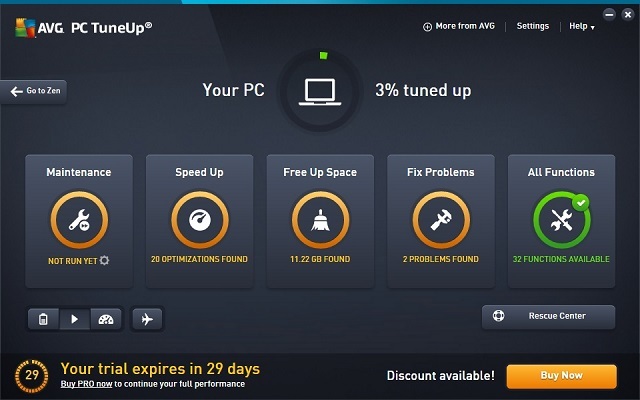 AVG TuneUp, in its earlier avatar as TuneUp Utilities, was one of the most bloated and reviled PC utility programs available, but has changed quite a bit since being taken over by AVG, one of the best-known and well-respected antivirus-makers in the world. While CCleaner has a much more minimalist interface, AVG TuneUp looks more polished, although, most of what is offers are along expected lines for a program in its class. The software allows you to remove web-surfing history, temporary files and other unnecessary elements in just one click, although, you can also have more granular control on what to erase and what not to. The program also comes with utilities that enables you to optimize system startup, defragment the hard drive, clean broken keys in the Windows Registry, restore accidentaly deleted files, modify hidden settings, customize Windows appearance, check your hard drive for errors and more. There’s also a file shredder, a startup optimizer as well as a defragmenter that come bundled with this program. There’s also an Economy Mode that promises to extend your laptop battery, but I couldn’t really check that out on my office desktop. Overall, the program looks fairly promising, but it’s a late entrant in a segment which has a lot of competitors, so it will be interesting to see how successful it is, going forward. A lot of people don’t always realize that Windows already has a built-in disk cleaner. It is fairly easy to operate, in so far as you can choose only one drive to scan at a time, and and once done, the utility will give you a list of objects that it thinks can be deleted. You can then select the ones you want to get rid of, and keep the ones you think might be important for you. While the native Windows disk cleaner does get the job done for the most part, it takes up way too much time and, from what I’ve noticed on multiple PCs, even starts to hang unless you’ve got a lot of free space on your hard drive. 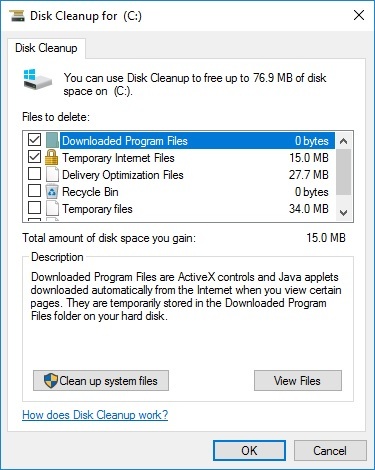 Windows Disk Cleanup may not be a fashionable way of getting rid of unwanted files, nor will it offer you all the bells and whistles that are offered by even free third-party utilities, but if you don’t want to install any more programs on your overloaded computer, or are confused by all the available options in the market, the native cleaning utility within Windows is definitely worth giving a go. While most of the issues fixed by PC maintenance utilities can be taken care of manually, it requires a great deal of patience and knowhow to do so without messing something up, which is why PC maintenance suites come in. They make it easier for you to detect some of the more glaring issues with your PC that may be degrading the performance of your beloved machine. While none of the are perfect, some of them are better than others, but you’ll need to be cautious while using them, because wrongly-deleted registry keys and system files can actually result in you device becoming unusable. That being the case, you should probably look for a safe PC maintenance utility rather than a feature-filled one, and in my personal experience, CCleaner, PrivaZer and Advanced SystemCare are as safe as they come, so you won’t have to worry about doing more harm than good while using any one of them. So that was our list of the best CCleaner alternatives you can use on your computer. Do you use any one of them, or do you use any other pc maintenance software available on the market? Whatever be the case, please feel free to leave your thoughts in the comments section below, because we love hearing from you.